With Chanukah just around the corner, I've been thinking a lot about Chanukah music and one song in particular. It's not just that it's insipid and babyish and cloying and maddeningly repetitious. No, I hate "The Dreidel Song" because it lies. It lies about every aspect of the dreidel— from what it's made of to how you play the game. And it's also supremely poorly written. But it's the only Chanukah song most Jews know, when there are hundreds of others that are better… and so every year I have to hear, "Why aren't there any good Chanukah songs? Why didn't all those great Jewish songwriters write any?" asked by people who never raise a mouse-clicking finger to try to find any. Yes, there are good Chanukah songs, great Chanukah songs— tons of them— and you can read about them here. No, you didn't. You did not make your own dreidel. Nor did anyone you know. Dreidels come from the store, or in gift bags. There are very nice ones that are made by artists, and cheap-o ones that are made by machines. But you do not own or use a dreidel you made. Tell the truth! No, it's not. Clay dreidels don't work. It is almost impossible to make one that is balanced enough to spin well. I actually have two clay dreidels and they spin the worst of all the ones I have, and I have way too many. More than 30. Clay dreidels are almost always uneven, and land as predictably as loaded dice. Another reason you don't see any clay dreidels. They are children's toys, and kids can't wait that long. Further, true clay art is fired in kilns, not air-dried. Really? "Shall?" Who are you, Sir Walter Raleigh? Did ye get thy dreidel at yon Dreidel Shoppe a Renaissance Faire? Who says "shall"… or has for the past century or two? "It has a lovely body"
No, it doesn't. The last person with a body that shape was a Chicago Bears lineman named William Perry, and his nickname was "The Refrigerator." A violin has a lovely body. If anything, a dreidel has one "leg." It wouldn't spin on more than one. Look at a ballerina or figure skater. When you spin, it's on one leg. Not really. The base of a dreidel isn't that much smaller than the "body" part. And the base also isn't "thin" but tapered. 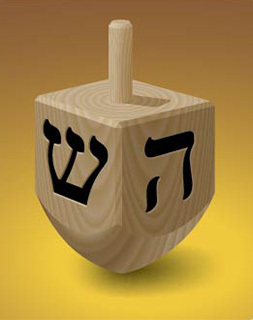 In fact, the top of a dreidel's base is usually as wide as the body itself. No, you don't. If it lands with two of the four faces up, either nothing happens ('nun') or you actually lose pieces ('shin'). If it lands with the 'hey' up, you do get half the pot, but you don't win the round. And even if it lands on 'gimmel,' you don't win, because even though you win the round, the game continues until one player wins all the other players' tokens or until the latkes run out.